One afternoon not too long ago my husband and I were on a date. All we were doing was sitting on a park bench talking, but since we didn't have the kids with us, it felt like a holiday. One nice thing about being out and about without kids is the ability to people watch, and on this day we saw something fascinating. It was a mother with three daughters about the same ages as our three sons. (That would be 5, 3, and 1, for those of you keeping score.) She parked her stroller by a bench, let her toddler out, then sat down and opened a book. My husband and I were practically on the edge of our seats in amazement. These three little girls were allowed to wander freely, but at no point did they get more than twenty feet away from their mother, who never seemed to say a word of admonition to them. And their activities were so calm that their mother was the picture of serenity. None of them was trying to break big sticks against the trunks of trees. No one was attempting to murder unsuspecting pigeons. Not one of those little girls was picking up five-pound rocks and heaving them into mud puddles. They weren't tearing branches off the bushes. They weren't even running. In fact, I'm not sure what they were doing. From what we could see, it looked like they might have been talking to the grass and the flowers. I have to admit that I might have felt an eensy, weensy twinge of envy towards that mother who could go to the park and read a book while her children played calmly (and quietly) by her side. Being a mother of boys has turned me into a referee, and the only time I have the leisure to sit and read anything is when at least one of the boys is asleep. But as I thought about it, I had to admit that my life is so much more interesting because of the cheerful rowdiness of my boys. And as they grow, they hold out the promise of becoming men of strength, conviction, and integrity. I can't think of a better reward for all the hard years of labor that I'm putting in now than to see my sons grow into godly men. I'm sure that daughters who grow into godly women are an equally great reward, but somehow that image doesn't give me goose bumps the way imagining my sons all grown up does. There is something profoundly inspiring in the quiet courage of a man who knows what he believes and is willing to stand up for it. I've had several men like this in my life, and how I pray that my sons will grow up to be like them! And so it is with renewed hope and energy that I face the task ahead–the day-in and day-out job of training my children, by word and example, to be all that God is calling them to be. If you enjoyed this, please consider subscribing here. I would be honored to have the privilege of encouraging you on a regular basis. This entry was posted in Inspiration and tagged boys, parenting by Sharon. Bookmark the permalink. 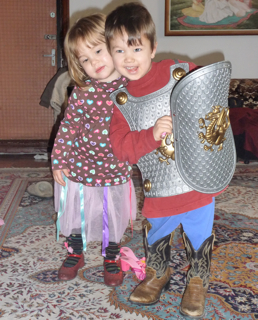 There is a difference between boys and girls, of course, but I’d be more likely to ascribe what you saw to the wonders of Ukrainian parenting. You turned it all into a lovely encouragement for mothers of boys (and active girls), though. Yes, I do. But I also feel sorry for the little boys I see around me all the time who aren’t allowed to handle sticks or get dirty or play freely. Child raising here seems to consist of mostly “Don’t touch!” and “Don’t get dirty!” My personal philosophy involves a lot more hands on learning about the world around us. It would be nice to sit and read, but it’s so much more fun this way! haha, I laughed when you listed off the things your boys would be doing outside because they are all the same things that Kyrstin would be doing. =o) But she does also sit and talk to the flowers and grass ;o) I agree whole heartedly with the joy and spice a vivacious child brings! That’s funny that Kyrstin does all those things. She does seem like a take-charge kind of girl!